Mokumeganeya’s elegant pieces are individually crafted with exquisite woodgrain patterns made from different colored forged metals. Mokumeganeya delivers precious rings worthy of once-in-a-lifetime moments. To create your desired rings, first we will ask you to select the design sample that most closely resembles the look you are hoping for. From the selected design, our concierge will be able to offer you options for patterns and shapes to customize the design so as to achieve a perfect match. Mokumeganeya offers designs that embody traditional Japanese culture. Through our artistry in working with metals and stones, each of our designs captures soul and emotion. By choosing the design that comes closest to what the two of you have imagined, we can help turn your wishes into reality. After choosing the design sample, the next stage is to discuss your preferences and the possibilities in a design meeting. You will select the metals that form the basis of the coloring and pattern, as well as any symbols or message you would like engraved. Once we have settled on the design you like, the meeting will come to a close. 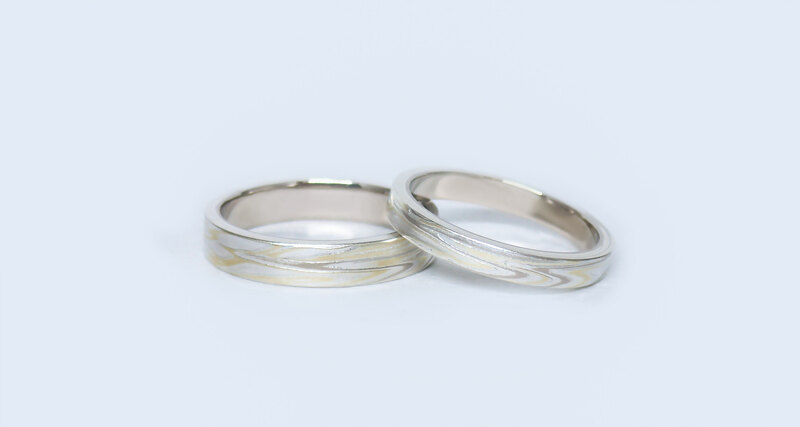 We, MOKUMEGANEYA, offer made-to-order rings for your wedding. 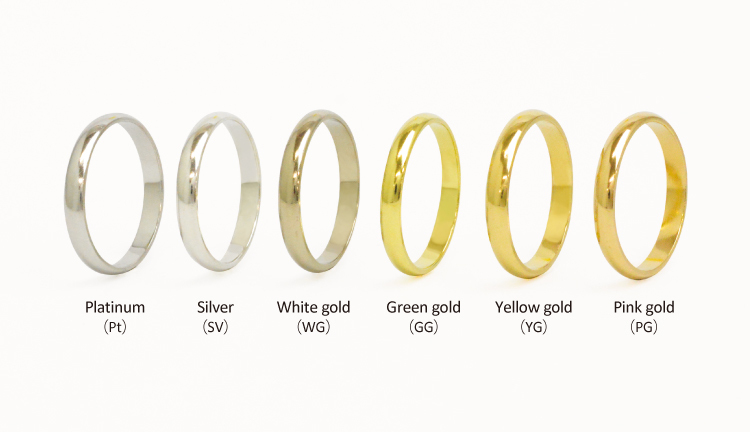 You will start with choosing the metal for your rings. 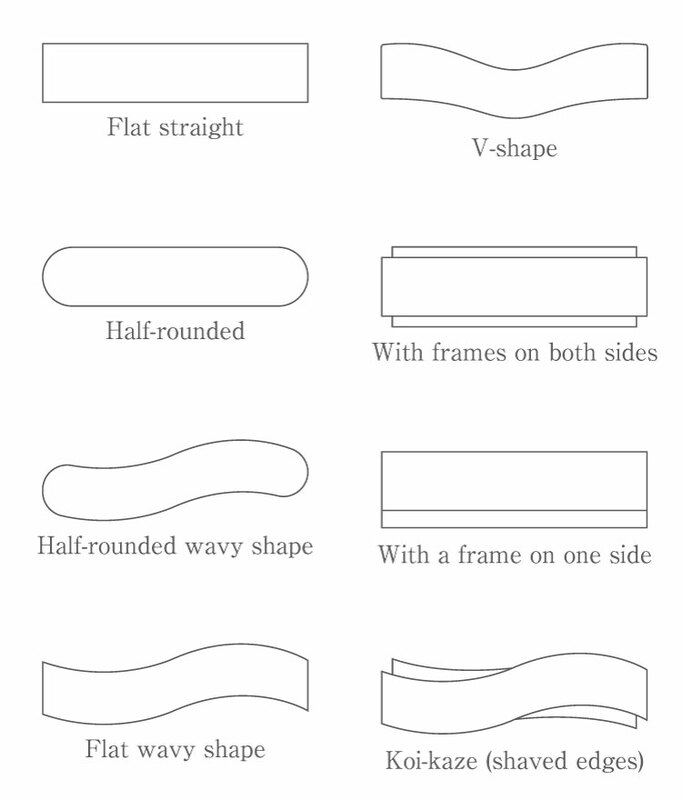 Take a look at the descriptions below to learn about the characteristics of each metal. Platinum (Pt) creates a bluesish grey look. Its grey coloration is between white gold and silver. Silver (SV) is the whitest and brightest out of all the metal. It creates a canvas for the other colors. White gold (WG) is a deep grey color. Green gold (GG) resembles fireflies. It is a fresh lemony color. Yellow gold (YG) is usually this color in general. It holds a warm yellowish appearance. Pink gold (PG) is a warm color resembling a cherry blossom. It blends well on skin. Mostly, the color of the gold changes depending on the ratio of silver and copper. When silver is added more, the gold looks whitish. Green gold is created by adding silver mostly to gold. On the other hand, copper is added more, the gold looks close to red gold. 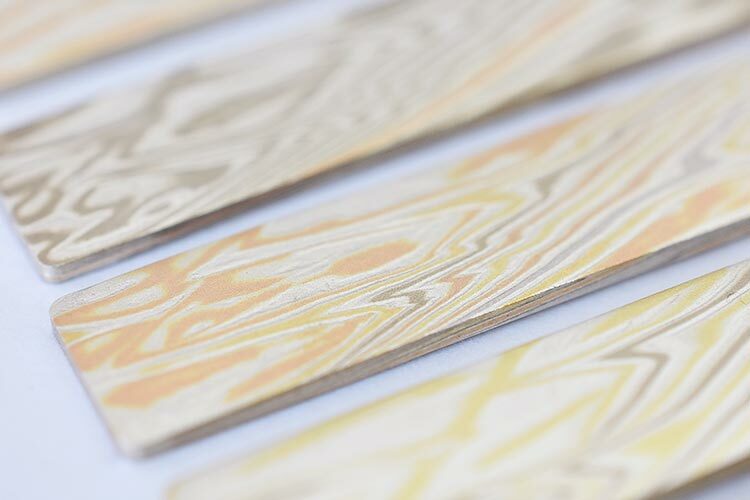 We make wood grain pattern by laminating many kinds of color metal. It is very easy to laminate pure gold(K24) and pure platinum (Pt1000), but they get easily scratched. By various research results, we succeeded to laminate K18 gold and platinum (Pt900), which have high hardness, to make wood grain pattern even though they are not suitable for laminating. We will introduce our recommended color combination. 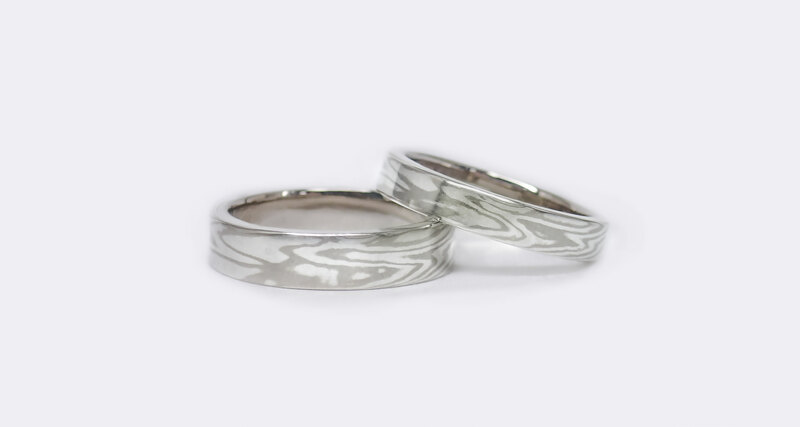 The contrast between the light white of silver (SV) and the deep grey of white gold (WG) is very beautiful. This combination is recommended for whoever wants pattern to appear clearly. 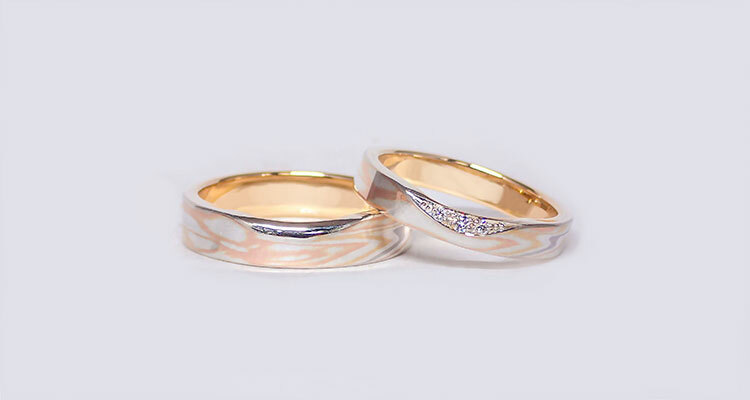 You can enjoy its soft pattern which is blended to skin very well with the warm pink gold (PG) color. Its elegant appearance with the light silver color suits any occasion, fashion, and other jewelry. This combination is very popular among both males and females because of the calm shade. 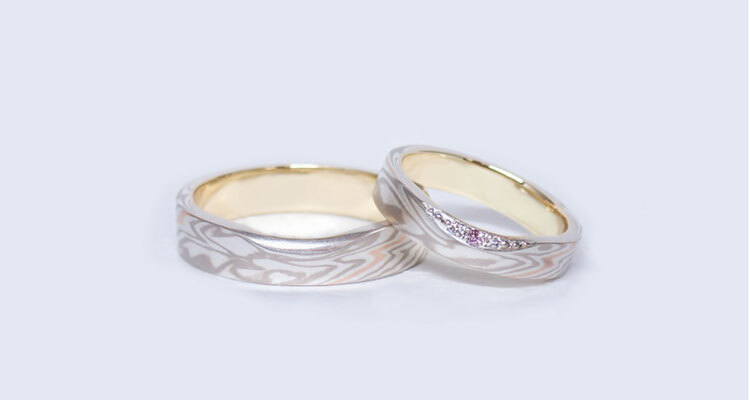 One point motif of pink gold among white metal represents “the red thread of fate.”The red thread of fate. This combination is recommended for whoever likes to have romantic images, white metal, and something simple. The balance of the clear white gold color and the warm pink gold color is very beautiful. This combination is recommend for whoever wants both clear pattern appearance and but blend well on skin tone. You can enjoy the fresh “green gold (GG)” with this combination. This is only one shade that you cannot find with plain single metal. This combination is recommended for whoever wants to wear rings simply but not too simple. You can enjoy all of the seven metal colors with this combination. Its soft and gentle appearance enable all people to wear regardless of their years. This combination is recommended for whoever wants to enjoy the special and luxurious color shade. First, request the information materials and browse through the design samples. When you find a sample design that looks similar to what you desire, do not hesitate to send us a request for a free quote. It is perfectly fine if you do not have any particular preference in terms of metals and customization, or an exact idea of what you would like. Our concierge will work with you to integrate your wishes and suggest beautiful combinations. If you are looking for a truly unique ring, create it with Mokumeganeya. 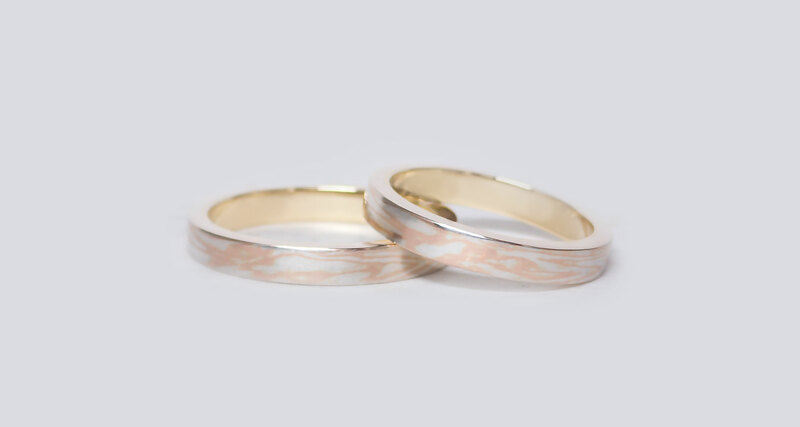 It will bring to life the ring of your dreams, forged from the combination of Mokume Gane and your custom design.